Plymouth - Black and white 6 1/4" x 9 1/2" ad has a small photo of a Dark-Colored Four-Door De Luxe Plymouth. 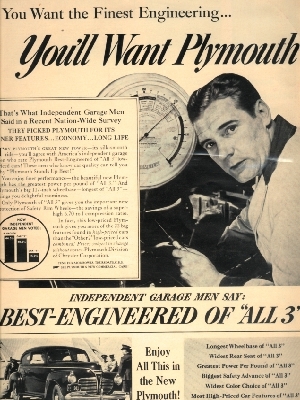 The ad also contains a larger photo of Walter P. Chrysler letting you know that the ad will explain his statement "Why I believe Plymouth is the Best Engineered Car in the Low-price Field." Plymouth - Black and white 6 1/4" x 9 1/2" ad has a photo of a lady who is getting into her new Plymouth asking her husband "Who's Afraid of Traffic?". There is another photo that shows a side view of this car with a group of people standing and admiring this car which the ad headline claims can be bought for "$495 and up". Plymouth - Black and white 7 1/2" x 11" ad that discusses more reasons why people chose Plymouth. The ad starts with a photo of Interior Decorator Wallace Barbour who claims to have chosen Plymouth because "My Profession Demanded 'Swank' My Family Needed Safety!". There are two other pictures that show his De Luxe Plymouth Sedan. The smaller picture shows him loading 'fragile furnishings" into his Plymouth and the larger picture shows Mr Barbour and the rest of his family enjoying a picnic at an out-of-the-way spot that his Plymouth delivered him to. 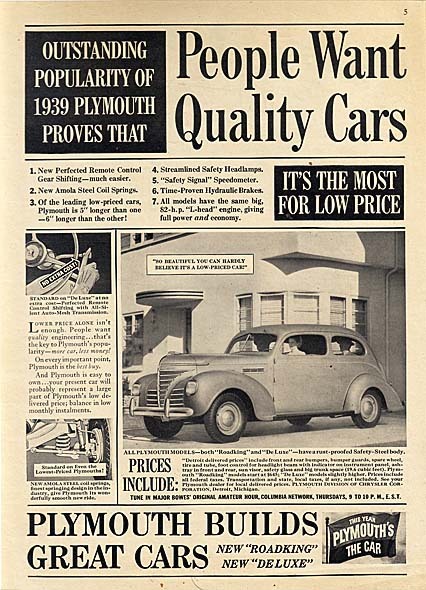 The ad lets us know too that prices for 1934 Plymouth's started at $530. Plymouth - Black and white 9 1/2" x 14" newspaper ad that encourages you to compare this year's Plymouth with the other two popular cars for price and size. The ad headline brags "Again we say - Look at all Three!" and shows black drawings of the three cars with their prices ($575 - $590), their lengths and compares some of their safety features. This ad is larger than my scanner bed so the outer edges of the ad will not be visible in the scanned view. Plymouth - Black and white 8" x 11 1/4" ad from a newspaper for the "Plymouth Dealers of Kent County". The ad headline claims that "Today 'All Three' cost about the same!" and gives the prices of Plymouth compared to Car A and Car B. The prices for each of these cars is in the $500 range. Plymouths - Black and white 8 3/4" x 12" ad for their cars with emphasis on the Motors. There are several pictures of Airplane Engine Developer Walter Zepke in and around his De Luxe 2-door Touring Sedan and his comments, according to the ad, amounting to a "certified interview". 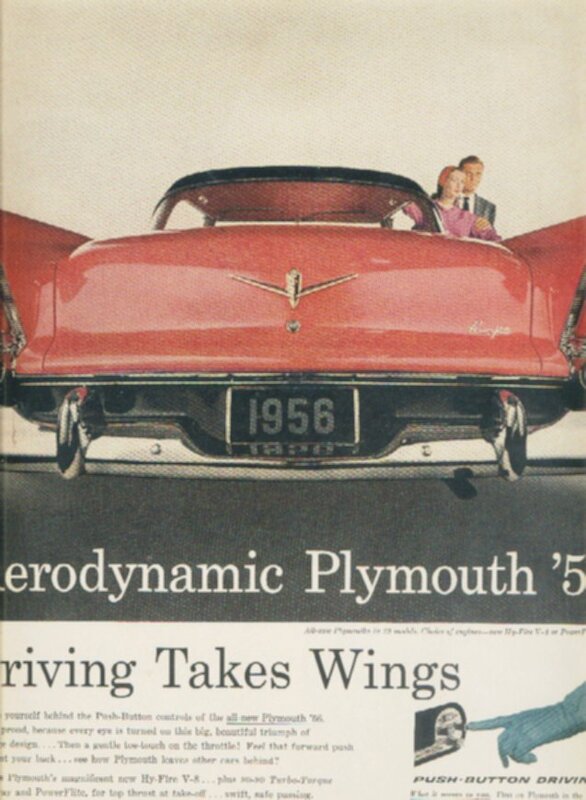 He compares some of the features of a Plymouth to standards demanded in the Aviation Industry, claims in the headline that "A Sweet-Running Motor is Music - to Me" and the price mentioned for the car shown is $510 or $25 a month - "Including Everything". Plymouth De Luxe Four-Door Touring Sedan - Black and white 9 1/2" x 12 1/2" ad has a photo of a light colored 1937 and another photo of a 1929 Plymouth owned by Oscar Hurless of Hastings, Michigan. The ad headline claims that Oscar "Has driven Plymouth 102,000 miles: Still loves to drive it". This ad is larger than my scanner bed so the outer edges of the ad will not be visible in the scanned view. Plymouth - Black and white 7 1/2" x 11 3/4" ad that extols the low cost of upkeep when you own a Plymouth. The ad has a picture of a Miss Elisabeth Warren sitting at her typewriter under the headline "Newswriter reports on '35 Plymouth. 'Smartest choice I ever made'". The ad claims that she has previously "owned 'All Three' low-priced cars" and is most happy with her Plymouth. She claims that "I've had very little upkeep expense in 58,000 miles" and that she has been able to "get over 20 miles per gallon of gas". The ad claims that she even still has one of her original tires in the trunk as a spare. 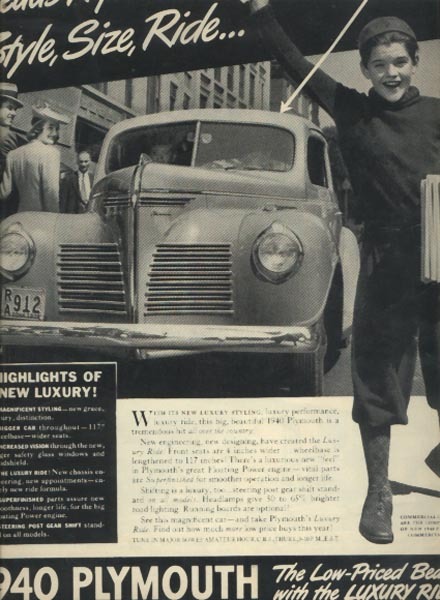 The ad further claims that the "New 1937 Plymouth has still more reliability...safety...beauty!". There is a picture of a Light-Colored Plymouth De Luxe 4-Door Touring Sedan parked at a curb while two ladies look it over. Plymouth - Black and white 8 1/2" x 12" ad with a drawing of a Light-Colored Coupe being driven past a group of people riding horses. The ad headline promises that it is "So Beautiful you won't believe it's still a Low-Priced Car". The ad mentions that the Plymouth 'Roadking' 5-Passenger Sedan can be yours for $685.This ad is larger than my scanner bed so the outer edges of the ad will not be visible in the scanned view. Plymouth "De Luxe" four-door Touring Sedan - Black and white 9" x 12" ad stating "In all three ways 'Plymouth's Got it'". It explains how it has Glamorous styling, Engineering features and New Lower Prices. Plymouth - Full color 9 1/2" x 13 1/2" ad has a photo of a Green four-door parked in front of a "No Parking" sign while the couple that drove up in it sit on the sign looking out at the water. As they enjoy the view there is a policeman standing next to the car admiring that view. The ad headline says "Big Surprise...the Price". This ad is larger than my scanner bed so the outer edges of the ad will not be visible in the scanned view. Plymouth - Full color 9 1/2" x 13 1/2" ad has a photo of a Green Four-Door that is stopped under a group of palm trees while the female driver talks to another lady standing next to her door. There is a man standing next to the passenger door while another man is taking a picture. The ad headline calls this car "A Beauty in any Setting". This ad is larger than my scanner bed so the outer edges of the ad will not be visible in the scanned view. Plymouth - Black and white 10" x 13 1/2" ad shows a photo of a front end view of this "Exciting car of 1940". The ad lists six "Highlights of New Luxury" that is offered in this new model. Plymouth - Full color 8 3/4" x 11 1/2" ad that flaunts their new Powermatic Shifting. The ad also describes the Glamorous new Fashion-Tone Interior. There is a little bit of red color bleeding through onto the white color. Plymouth - Black and white 9 1/2" x 13 1/2" ad with several drawings of a Dark-Colored Four Door being taken for a drive in the countryside. The ad headline promises that with this car you get "A Big Step Up in Style..Power..Value". This ad is larger than my scanner bed so the outer edges of the ad may not be visible in the scanned view. Plymouth - Black and white 9 1/2" x 12" ad that features a couple that have purchased a new 1941 Plymouth. 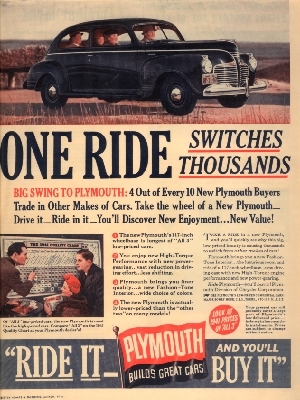 There are several photos of the car and the ad headline explains that "She said: 'Let's ride a New Plymouth' and Plymouth's ride decided us". This ad, bad grammar and all, is larger than my scanner bed so the outer edges of the ad are not visible in the scanned view. Plymouth - Black and white 9 1/2" x 12" ad has a large photo of a lady with a huge smile under the ad headline "Pin a Medal on Me!". She claims that "I got the family to ride in a new Plymouth and just look what we might have missed" and then mentions different improvements in this year's models. This ad is larger than my scanner bed so the outer edges of the ad will not be visible in the scanned view. Plymouths - Full color 10" x 14" ad that has pictures of a "Woody" Station Wagon, a tan colored Special De Luxe Coupe and a Convertible Coupe. The ad headline wants the reader to "Go Happily...Go Plymouth!". This ad is larger than my scanner bed so the outside edges are not visible in the view. Plymouth - Black and white 9 1/2" x 13" ad for Chrysler Corporation's No. 1 Car. The ad has a picture of Mr. James Balfe, sitting on a horse next to the front end of a new Plymouth, and says that "Riding is the Real Test". This ad is larger than my scanner bed so the outer edges of the ad will not be visible in the scanned view. Plymouth - Black and white 9 1/2" x 13" ad that came out at about the time of the attack on Pearl Harbor. The ad has a photo of a new Plymouth that is parked in a construction area and a man with blueprints under his arm is talking to the driver. The ad headline assures us that "U.S.A.'s Strength is Power to Produce" and the ad text, which was probably written before Decenber 7, does it's best to make us feel comfortable with very little sales pitch about the new cars. This ad is larger than my scanner bed so the outer edges of the ad will not be visible in the scanned view. Plymouth Wartime Efforts - Three color 9 1/2" x 13 1/2" ad has a photo of a wartime assembly plant with several men and one woman working on, what looks like, the undercarriage of an airplane. 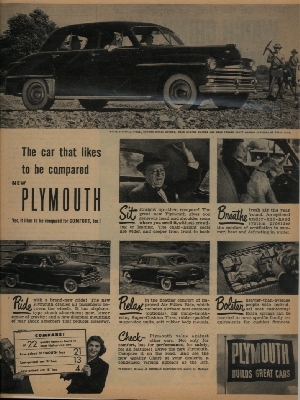 The ad has the headline torn out of a newspaper stating that "Plymouth Builds Great Cars" and contains the statement that it was "True Yesterday - In Trust for Tomorrow:. This ad is larger than my scanner bed so the outer edges will not be visible in the scanned view. Plymouth Wartime Efforts - Black and white 9 1/2" x 13" ad for wartime efforts. The ad has a drawing, done by Lyle Justis, of a foot soldier smiling while he carries his rifle over his shoulder. The ad headline calls him "The mightiest weapon of war" and the ad mentions some of the items that Plymouth is helping to build to support the war effort. This ad is larger than my scanner bed so the outer edges of the ad will not be visible in the scanned view. Plymouth - Full color 10" x 13 1/2" ad with a series of drawings of a Brown Four-Door being enjoyed by a family in a trip through the countryside. The ad headline assures us that "It's Plymouth for Beauty". This ad is larger than my scanner bed so the outer edges of the ad will not be visible in the scanned view. Plymouth - Full color 10" x 14" ad that has a drawing of a Green Four-Door moving along a rural road with gleeful passengers. The ad has a box that compares Plymouth with Car #2 and Car #3 and the headline summarizes by saying that "This Box Score Shows Your No. 1 Car Buy". This ad is larger than my scanner bed so the outer edges of the ad will not be visible in the scanned view. Plymouth - Full color 10" x 13" shows a bright red four-door flying through a western landscape as the smiling family enjoys the view. Plymouth - Black and white 6 1/4" x 9 1/2" ad for the Roominess of the Plymouth cars. The ad has a picture of a man and a little girl sitting in the back seat of a Plymouth having the room to toss and catch a balloon. The ad headline says that "Inch by inch...mile after mile It's Plymouth for Roomy, Pillowed Riding Ease". Plymouth Special De Luxe 4-Door Sedan - Full color 9" x 12" ad has a picture of a Blue Four-Door that is filled with six adults and is being driven against a white background. The ad headline assures that it is "Just your style! The great new Plymouth" and describes many of the ways this car has 'beauty'. This ad is larger than my scanner bed so the outer edges of the ad will not be visible in the scanned view. Plymouth - Full color 9 1/2" x 12 1/2" ad with a drawing of a Red Four-Door filled with people driving on a dirt road. The ad headline calls it "The car that likes to be compared - for Value". This ad is larger than my scanner bed so the outer edges of the ad will not be visible in the scanned view. 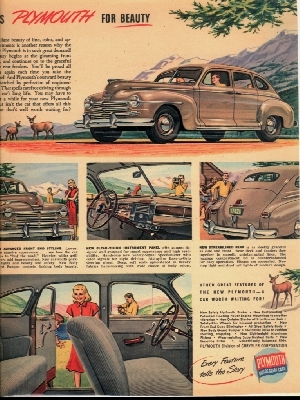 Plymouth Four-Door - Full color 9 1/2" x 13" ad has a drawing of a Red Four-Door being driven with three people seated comfortably in the front seat. The ad headline promises that "Many features of costlier cars make it..The car that likes to be compared!". This ad is larger than my scanner bed so the outer edges of the ad will not be visible in the scanned view. Plymouth - Full color 10" x 13 1/2" ad has a drawing of a Green two-door being driven by a happy couple. The ad headline claims that this car "Shows up best in a show down". This ad is larger than my scanner bed so the outer edges of the ad will not be visible in the scanned view. Plymouth - Black and white 9 1/2" x 13" ad shows several photos of a Dark colored four-door being driven and being admired by the family that owns it. The ad headline calls it "The car that likes to be compared. New Plymouth". This ad is larger than my scanner bed so the outer edges of the ad will not be visible in the scanned view. Plymouth - Full color 9 1/4" x 12" ad has a drawing of a Red Convertible with the top down being used by two couples to transport them on a drive along a road that follows the edge of a lake. The couple in the front seat are trying to make sure the car stays balanced while the couple in the back are sharing the same spot. The ad headline calls this "The car that likes to be compared - New Plymouth". This ad is larger than my scanner bed so the outer edges of the ad will not be visible in the scanned view. Plymouth - Black and white 9 1/2" x 13 1/2" ad with a large side view photo of a two-door and five smaller photos of different features of this model. The ad headline calls it "The car that likes to be compared". This ad is larger than my scanner bed so the outer edges of the ad will not be visible in the scanned view. Plymouth Wagon - Full color 9 1/2" x 12 1/2" ad with a drawing of a woody station wagon parked, filled with children, in the area of a circus. The ad headline describes this as "The car that likes to be compared - new Plymouth". This ad is larger than my scanner bed so the outer edges of the ad will not be visible in the scanned view. Plymouth - Black and white 10" x 13 1/2" ad that has six interior and exterior photos of a Dark-Colored Four Door. The ad headline calls this "The car that likes to be compared. New Plymouth". This ad is larger than my scanner bed so the outer edges of the ad will not be visible in the scanned view. Plymouth - Full color 6 1/4" x 9 3/4" ad has drawings of a Green Four-Door and a Red Four-Door being driven with carloads of happy passengers. 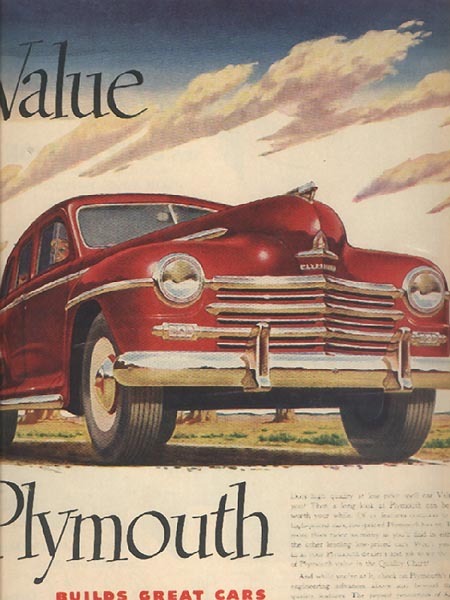 The ad headline claims that the "New Plymouth" is "packed with value and ready to prove it!". The ad text talks about some of the amazing features on this leader in the low-priced car field. Plymouth - Black and white 9 1/2" x 13" ad for the overall value of the new Plymouth. The ad headline calls it "Packed with value and ready to prove it! The soft-gliding new Plymouth" and has five different photos that help explain just how comfortable this car can be when being driven. This ad is larger than my scanner bed so the outer edges of the ad will not be visible in the scanned view. Plymouth Station Wagon - Full color 6 1/2" x 9 3/4" ad has a drawing of a Wood-Sided Station Wagon filled with people pulling up to a football stadium on an Autumn afternoon. The ad headline says "Plymouth - it goes to the stadium...for eight!" Plymouth - Full color 10" x 13" ad for the new Plymouths. 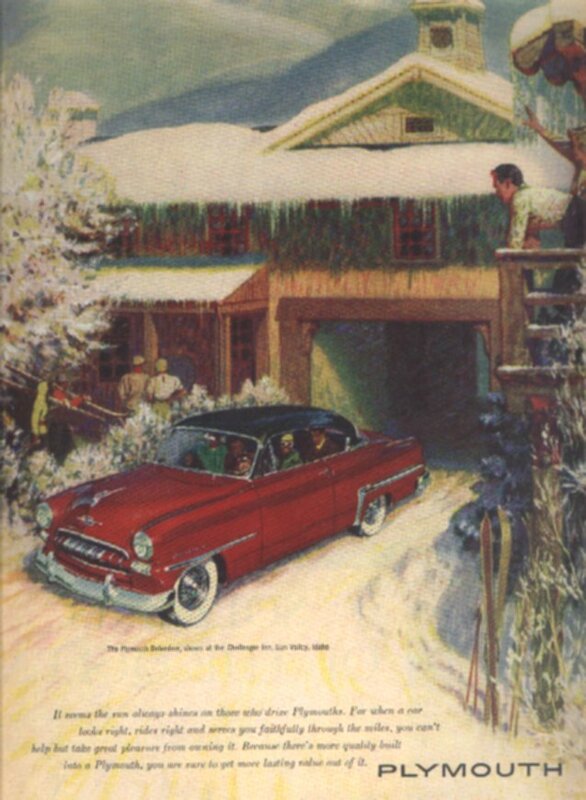 The ad, painted by Norman Rockwell, is a picture of a family arriving at Grandma's house on Christmas Eve. The family of five are all carrying presents and the youngest, a little boy, stops at the bottom of the stairs and hollers up "Merry Christmas, Grandma...we came in our new Plymouth!". This ad is larger than my scanner bed so the outer edges of the ad will not be visible in the scanned view. Plymouths - Full color 6 1/2" x 10" ad with a painting by Norman Rockwell. The ad shows a snowy night where a family of five has arrived at Grandma's house bearing presents and the youngest boy stands at the bottom of the stairs while he hollers "Merry Christmas, Grandma...we came in our new Plymouth". This ad is a smaller version of one on this page. Plymouth - Black and white 7 3/4" x 10 3/4" ad that talks about the True Balance that is designed into all of their 1953 Models. There is a picture of an elderly couple sitting in a Dark-Colored Plymouth Four-Door in front of a house where they are talking to another elderly couple and a grand-child. The headline urges you to consider, "What does the '53 Plymouth's new true balance mean to you?" and begins by talking about some of the basic items like the extra 100 horsepower due to 7.1 to 1 compression pistons and a new one-piece windshield. It then gets into the handling by claiming a "New control of Pitch", a "New control of Roll" and, of course, a "New control of Jounce". The text explains what was done to improve all three of these things and now, even though I am not sure what Jounce really is, I know how to prevent it. Plymouth Belvedere - Full color 10" x 13" ad with a very snow-covered day and a Red Two-Door Plymouth Belvedere is pulling away from the Challenger Inn in Sun Valley, Idaho. The car is filled with people and some of the people staying are peering at the people and others have their backs turned. This is a very unique picture and it brings out the cold with all of the snow and icicles. The text says "It seems the sun always shines on those who drive Plymouths. For when a car looks right, rides right and serves you faithfully through the miles, you can't help but take great pleasure from owning it. Because there's more quality built into a Plymouth, you are sure to get more lasting value out of it". Plymouth Cranbrook Sedan - Full color 6 1/4" x 9 1/2" ad of a Dark-Colored Sedan pulling away from the Greenbriar in White Sulphur Springs, West Virginia. The couple who are driving the Plymouth seem to be as pleased with their stay at the luxury hotel as they are with their car. Plymouth - Black and white 8" x 10 1/2" ad has a drawing of a light-colored two-door against a small town look. 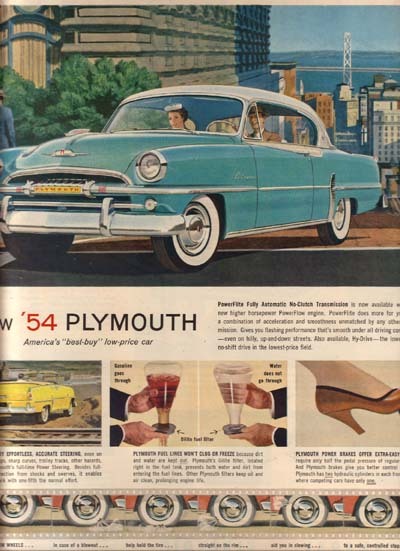 The ad headline introduces "New '54 Plymouth. Under the Beauty Solid Value". Plymouth - Full color 9 3/4" x 13" ad shows a Blue Belvedere having no problems on the hills of San Francisco. The ad headline claims that this car "Does the most for you - worth the most to you". Several smaller drawings in the ad discuss several of the safety and performance features that make this statement true. This ad is larger than my scanner bed so the outer edges of the ad are not visible in the scanned view. Plymouth - Full color 10" x 13" ad has a photo looking at this model from the back-end and calling it "Aerodynamic Plymouth '56". The ad also talks about the push-button transmission. Plymouth Belvedore 4-Door Hardtop Sport Sedan - Full color 6 1/2" x 9 3/4" ad with several views of a Red Four-Door. The larger photo shows the driver's side passenger door opened to reveal the formal interior and the formally dressed lady in the back seat. There is a smaller photo of this car from behind and the headline calls it "The car that's going places with the Young in Heart". Plymouth Belvedere 4-Door Hardtop Sport Sedan - Full color 10" x 14" ad for the Full-Time Power Steering that is now available on cars from the Chrysler Corporation. The ad headline says that the Power Steering is just "One of 5 Forward Look values other cars don't have". Under the picture of a Red and White Plymouth Belvedere 4-Door Hardtop Sport Sedan preparing to pull onto a hilly highwar the text lists these five features now available. These include the 1: Full-Time Power Steering, 2: Pushbutton Powerflite, 3: Greater Power longer, 4: Safest Brakes, and 5: Brightest design note. This ad is larger than my scanner bed so the outer edges of the ad will not be visible in the scanned view. Plymouth Fury - Full color 10" x 13" ad says that "Suddenly, It's 1960...Plymouth!". The ad claims that the new 1957 is so far ahead of it's time. Plymouth Suburban Station Wagon - Full color 13" x 9 1/2" ad has a picture of a Blue and White Wagon that is parked behind a sand dune with the ocean on the other side. The family of five is beginning to unload all the items that two parents and three young children will need to have fun at a place like this. The ad headline has them saying that "We're not wealthy...we just look it!". This ad is larger than my scanner bed so the outer edges of the ad will not be visible in the scanned view. Plymouth - Full color 10" x 14" ad that wants to get us to believe that, with two different men, "Their boats are different, but they both drive Plymouth's". There is a large photo of two different men, one man all dressed-up in a seafaring jacket with a captain's hat on and the other casually dressed, both standing there talking about, well, whatever. They both have driven up in Plymouth's that are very similar, in color and everything else. The man with the Captain's hat has parked his next to the cabin cruiser that he owns and the other one is pulling a small boat behind his. The text says that One man owns an outboard, the other owns a cruiser. They are equally proud of their identical '59 Plymouths, for Plymouth offers nearly everything anyone could want". Plymouth Suburban - Full color 9 1/2" x 13" ad has a large photo of a Red Station Wagon being loaded with pumpkins and other Autumn farm products by a family. The ad headline says "For '59...only Plymouth wagons give you so many luxury features...and low price, too!" This ad is larger than my scanner bed so the outer edges of the ad will not be visible in the scanned view. Plymouth Station Wagon - Full color 10" x 13" ad shows a blue and white wagon parked in front of a place called Lawry's as the husband helps his wife out of the passenger seat. The ad headline says "...and this morning it brought home the groceries"
Plymouth - Full color 10" x 13" ad shows a Green Plymouth driving towards us while going through a curving tunnel. The ad explains the concept of the "Solid Plymouth 1960" by saying that "We believe we have just about every grunt, squeak, squeal, groan, whine, buzz, rap, rattle, beat, twang, cling, hiss, howl, rumble, roar, ruff, shudder, whistle and growl worked out of the solid Plymouth for 1960". It then says that "Each of these noises means something quite different to the engineer. Each was hounded out of the new Plymouth Dura-Quiet Unibody. This solid low-price Plymouth is truly quiet". Plymouth Fury - Full color 10" x 13 1/2" ad that is entitled "Solid Plymouth 1960". There is a Two-Door Plymouth Fury parked by what looks like a short dam and two well-dressed people are sitting on it and looking up as they admire it. The ad headline says that "Some people own cars. Some cars own people. We build the Solid '60 Plymouth for those who want to be boss". The ad explains this by saying that "Any car costs money to run. But it needn't "own" you. You should spend little to keep up the new Solid Plymouth. Chrysler Corporation engineers designed it to last rather than cost". They then talk about the new Dura-Quiet Unibody construction, the development of ways to beat rust, corrosion and noise and they improved the lively V-8 that was tops in the Mobilgas Economy Run in 1957, 1958 and 1959. 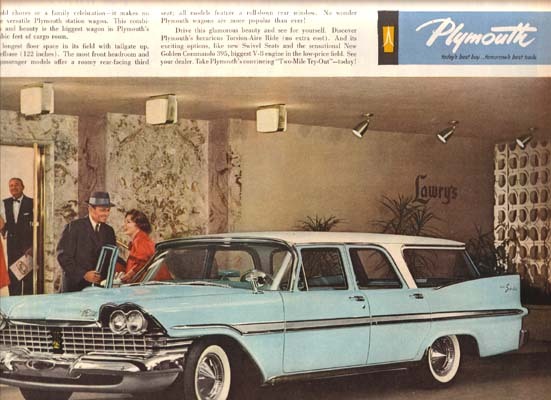 Plymouth Station Wagon - Full color 10" x 13 1/2" ad that discusses the "Solid Plymouth 1960". Pictured in this ad is a 1960 Plymouth Station Wagon that is parked at, I don't know, some sort of bus station or something that not many people are around. There are nine people who have come in on this wagon. There is a lady standing at the back while holding a young child, there are two boys who are about to jump off of the tailgate, there are two children sitting inside and pondering the out-of-doors and there is another lady standing at the front of the car with two older, somewhat, girls and holding what I think is a puppy. 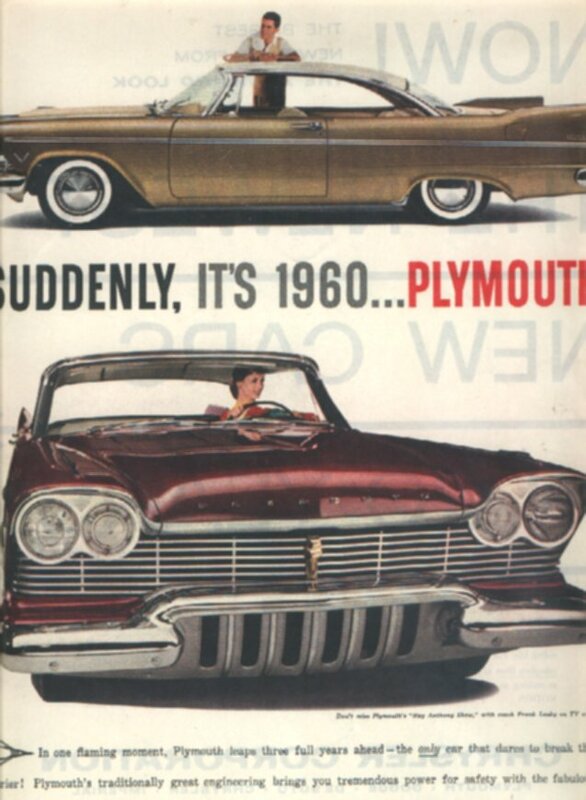 The ad headline says that "The Solid Plymouth for 1960 has been test driven the equivalent of 20 years of rough use. You wouldn't want to hang unto any station wagon that long but that's not the point". Plymouth Station Wagon - Full color 9 1/2" x 12 1/2" ad for the complete reliability and comfort engineered into these cars. The ad has a picture of a White Station Wagon parked in front of a terminal while a man loads his suitcases into the back while his wife and young child stand happily by at his return. The ad headline is the word "car' ness" and the rest of the text explains, in a dictionary sort-of-way, that this word means the reliability that you get when you buy a Plymouth. This ad is larger than my scanner bed so the outer edges of the ad will not be visible in the scanned view. Plymouth - Full color 9 1/2" x 13" ad has a photo of a Red Plymouth being driven by a couple on a road that is not much wider than this car. The ad headline asks the question "Are they making the turnpikes shorter this year?" This ad is larger than my scanner bed so the outer edges of the ad will not be visible in the scanned view. Plymouth - Full color 10" x 13" ad showing a red two-door parked on a beach as the sun disappears. The ad headline claims that it "Makes you feel today's the day! But there's plenty of tomorrow built into this one, too". This ad is larger than my scanner bed so the outer edges of the ad will not be visible in the scanned view. Plymouth - Full color 9 3/4" x 13 1/2" ad has a photo of a Gold colored Two-Door Fury parked among some large rocks. The couple that came in the car are sitting on these rocks enjoying the view and each other. The ad headline promises that "Plymouth is what solid means" and the first paragraph of the text describes this car as being "Strong. Sound. Stable. Durable. Tight. Quiet.". It then talks about the Unibody and the Torsion-Aire Ride that these cars provided. Plymouth Sport Fury - Full color 9 1/2" x 12 1/2" ad for the many ways that this car will prove to be Economical for you. The ad has a photo of a Blue Four-Door parked in a parking lot next to a man and his wife as they prepare to launch a model airplane. The man has knelt down to work on his planc and his wife is standing next to him, arms folded, and probably realizing that she already has the young son that she has always wanted. The ad headline says "Plymouth...known by the economy it keeps" amd the text talks about both the gas mileage and the long life that you can expect. Plymouth Station Wagon - Full color 9 1/2" x 13" ad has a picture of a Light Colored Station Wagon parked in a pasture with a small herd of cattle milling around the front of the car while a rancher sits on his horse behind the car. The ad headline promises that you can "Work it hard today. Tomorrow. Next month. Next year. The year after that. The year after-". It describes this car as being "put together to stay together" and mentions the car in Plymouth's construction that "pays off in day-in, day-out economy"
Plymouth - Full color 9 1/2" x 13" ad for their Forward Flair Design Styling. There is a picture of a White Four-Door parked in front of a darkly painted building where a young girl stands with an older woman while another young girl waits in the car. The ad says "Look at Plymouth now!" and promises that "No low-price car ever looked like this before!". The text claims this now look gives it a "poised look of power and purpose" and claims there is also "Exciting new Beauty Inside", that it is an "Elegant new way to save" and that it is "Built to Lead and Last". There are other claims that are hard to believe such as a "32,000-mile lubrication cycle on major chassis points" and that "you need oil changes only half as often". Plymouth Sport Fury Convertible - Full color 9 1/2" x 12 1/2" ad has a picture of a Brown Convertible with the top down parked at a field where small planes are flying overhead while others are parked on the ground along with a balloon straining to be let loose. Several couples are watching the activities but one couple is devoting all of their attention to this beautiful Plymouth. 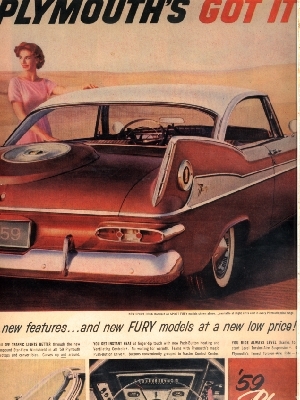 The ad headline starts by "Introducing Plymouth's New Sport Fury for the man who wants to go First Class...Fast!". The ad has several smaller pictures that concentrate on the luxurious interior, the rear deck, the Special Red, White and Blue Insignia, the performance and the new wheel covers. This ad is larger than my scanner bed so the outer edges of the ad will not be visible in the scanned view. Plymouth - Full color 9 1/2" x 12" ad has a photo of a red four-door that has just driven across a small wooden bridge with it's two occupants. The ad headline assures us that "Plymouth's on the Move" and the lady=passenger is sitting in the car while the photo is probably being taken by the driver. Yhe text talks about how this Plymouth is doing well in the "tough Plymouth-Ford-Chevrolet league" which is controlled by the "internal parts of the engine, transmission and drive-train." Plymouth Fury - Full color 9 1/2" x 12 1/2" ad has a picture of a Black Fury Four-Door being driven away from the camera on an asphalt roadway. The ad headline claims that "Plymouth's on the Move. Clean, Tough, Tight and a Tiger on the Road". The claim is then made that "We went all the way when we styled this new Plymouth. Clean lines. Flat decks. Uncluttered surfaces. The effect: terrifically good-looking. We built it to run long, run strong, too. It carries America's first 5-year warranty." 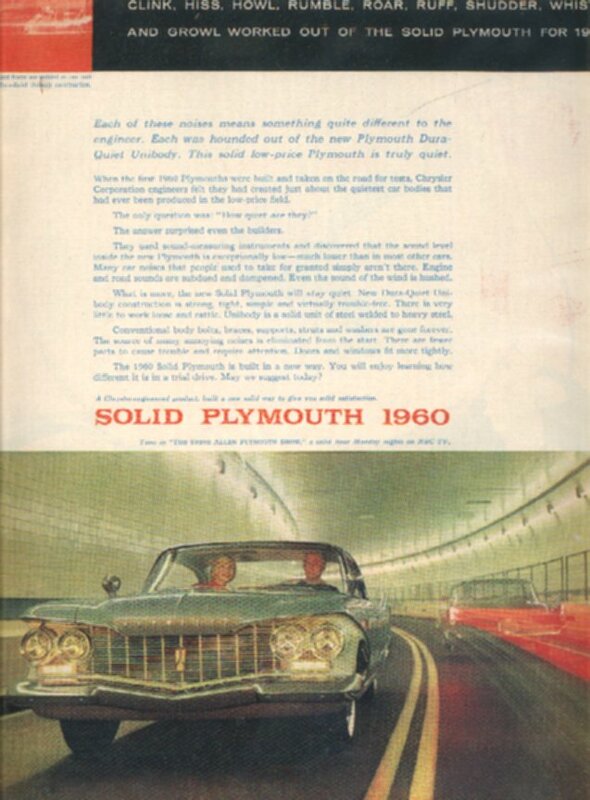 Plymouth Sport Fury - Full color 9 1/2" x 12" ad has a photo from behind of a Red Sport Fury being driven through a single lane tunnel by a man whose wife has turned to speak to him, probably to offer him advice on which way to go. The ad headline claims that "Plymouth's On The Move. You have to own one to catch one". This ad is larger than my scanner bed so the outer edges of the ad will not be visible in the scanned view. Plymouth Fury Convertible - Full color 9 1/2" x 13" ad has two photos of a Red Convertible with the top down. The top photo shows a lady sitting in the driver's seat and does a good job of illustrating how the interior looks. The other photo shows two ladies driving this car past two interested looking men. The ad headline claims that "Plymouth's on the move". This ad is larger than my scanner bed so the outer edges of the ad will not be visible in the scanned view. Plymouth Sport Fury 2-door hardtop - Full color 10" x 13 1/2" ad with a side-view picture taken of a Brown one of these taken, fully-crowded, and stopped on the road with a forest of trees behind it. The headline simply says "The 1964 Plymouth"" but the text above the picture says more. "When a new car comes out, people like to know what's new. On this one everything you see is new, including a new profile and new interiors. The deeper qualities are sensational performance and a 5-year / 50,000-mile warranty". The ad asks "Was it you who said give me a nice-looking car that really moves but doesn't cost too much" then responds with the answer "Here it is". Plymouth Sport Fury 2-Door Hardtop - Full color 9 1/2" x 12 1/2" ad has a photo of a Brown Hardtop pulling out of a dirt driveway onto an asphalt road in the countryside. The ad headline asks "Was it you who said give me a nice-looking car that really moves but doesn't cost too much? Here is is, with a 5-year/50,000-mile warranty to back up it's performance." The text talks about the qualities that make the 1964 Plymouth a tremendous value which includes the styling and performance. Plymouth Fury 2-door Hardtop - Full color 9 1/2" x 12" ad has a photo of a Red Fury taking three people for a ride in the countryside. The ad headline explains that "If you end up buying this car for it's good looks, but want to give your friends a more practical reason, open the glove compartment and pass around your 5-year / 50,000-mile warranty." This ad is larger than my scanner bed so the outer edges of the ad will not be visible in the scanned view. Plymouth Fury 2-Door Hardtop - Full color 9 1/2" x 12" ad has a photo of a Green 2-Door parked in the driveway of a yellow two-story house. The ad headline brags that "This is the kind of car that brightens up a driveway". This ad is larger than my scanner bed so the outer edges of the ad will not be visible in the scanned view. Plymouth Fury 2-door Hardtop - Full color 10" x 13" ad has a picture of a red car hardtop parked in a driveway while a happy family looks at their new transportation. 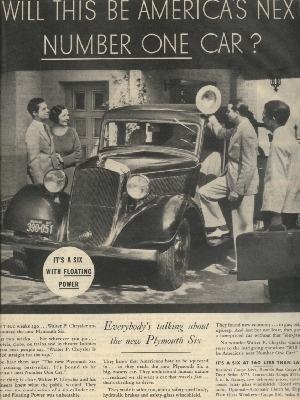 The ad headline claims that "This is the exact model Plymouth that beat Chevrolet and Ford in acceleration, handling, braking, gas economy - 'Things you buy a car for'." This ad is larger than my scanner bed so the outer edges of the ad will not be visible in the scanned view. Plymouth Belvedere - Full color 9 1/2" x 13 1/2" ad calls this car a new way to swing without going out on a limb. There is a picture of a Gold colored four-door parked in a lot with a happy couple rushing around to see all of it. The text explains that there are three different models available of the Belvedere and is appropriate for "families, secretaries and secretary watchers". Plymouth Fury Convertible - Full color 9 1/2" x 13" ad has a photo of a Red Convertible with the top down, parked on a sand dune while four people stand next to it and play instruments and sing. 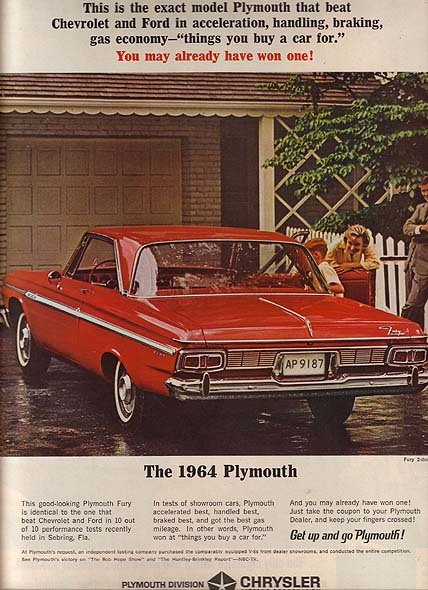 The ad headline states "1965 Plymouth Fury. Plush. What a trick to play on someone trying not to buy a new car this year." This ad is larger than my scanner bed so the outer edges of the ad will not be visible in the scanned view. Plymouth Fury - Full color 9 1/2" x 13" ad shows a white Sport Fury convertible that has stopped on the race track and the male driver has a lady leaning on each side of the car talking to him. The ad headline describes this car as "Plymouth Fury. Pace Car" and mentions how this car is the "official Pace Car of the 1965 Indianapolis 500". The text mentions that you can buy a car like this or you could win the contest that was beiug run by Plymouth Dealers. Plymouth Fury - Full color 9 1/2" x 12 1/2" ad has a picture of a Blue Two-Door being driven by a couple along a dirt road that snakes it's way through a field of golden brush. 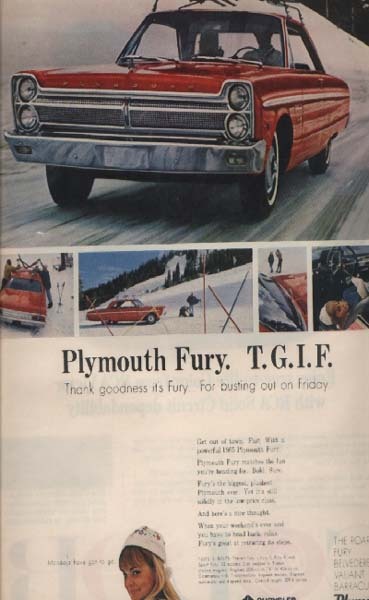 The ad headline calls the action "Plymouth Fury. Make tracks. A Fury is for getting off the beaten path. And making your own." This ad is larger than my scanner bed so the outer edges of the ad will not be visible in the scanned view. Plymouth Wagons - Full color 9 1/2" x 13" ad for the Wagons "that come in 3 different sizes. 16 different models". The ad has a large and a small picture of a Green Fury III Wagon, a small picture of a Yellow Belvedere II Wagon and a small picture of a Black Valiant 200 Wagon. The ad claims these vehicles are "Priced from $2361 to $3193" yet are the biggest, plushest Plymouths ever. Plymouth Belevedere - Full color 10" x 13" ad has a picture of a blue-green two door shown against a white background. 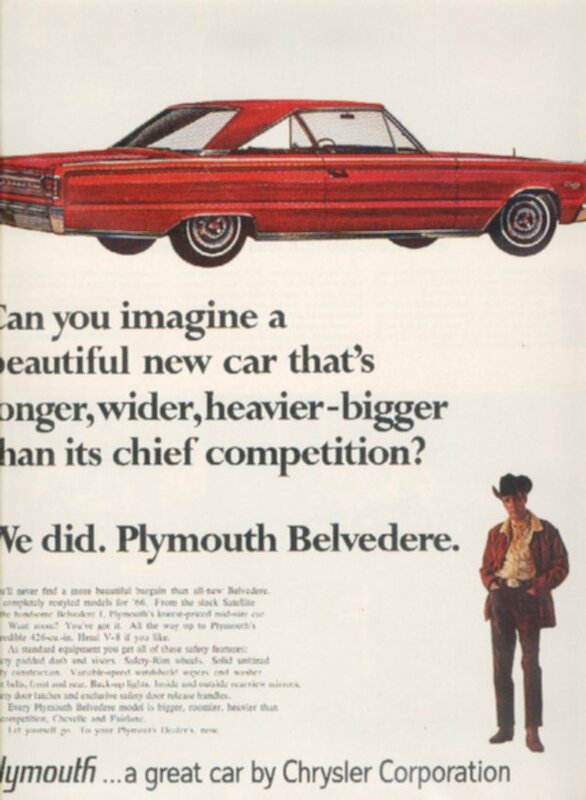 The ad headline proclaims that "Plymouth Belevedere is longer, wider, heavier-bigger than it's chief competition. Here are a few more good reasons for buying one" and goes into detail about some of the options. This ad is larger than my scanner bed so the outer edges of the ad will not be visible in the scanned view. Plymouth Belvedere - Full color 10" x 13 1/2" ad that tries to seperate this car from the other cars in its class. 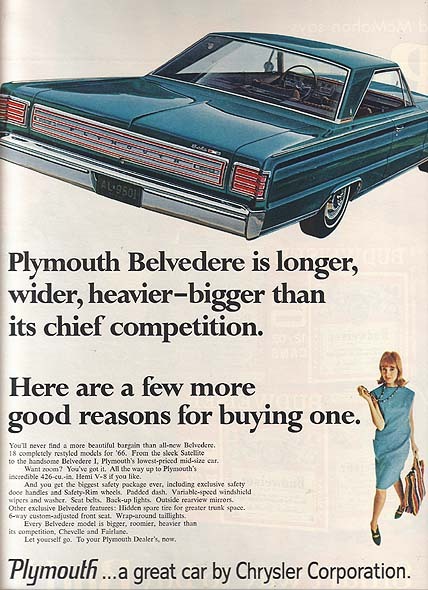 Under a picture of a Blue Belvedere two-door is the claim that "Plymouth Belvedere is longer, wider, heavier - bigger than its chief competition." It then goes on by saying "Here are a few more good reasons for buying one" and talks about features on this car plus mentions the other cars in the Plymouth line. At the bottrom of the ad are a happy couple who are dressed in shades of pink, loyal Plymouth owners. Plymouth Fury - Full color 9 1/2" x 12 1/2" ad shows a Blue Two-Door sitting against a white background. The ad headline explains that "We're showing you the front of this '66 Plymouth Fury in case you've only been seeing the rear". This ad is larger than my scanner bed so the outer edges of the ad are not visible in the viewed image. Plymouth Fury - Full color 10" x 13" ad shows a red two-door with a black top. 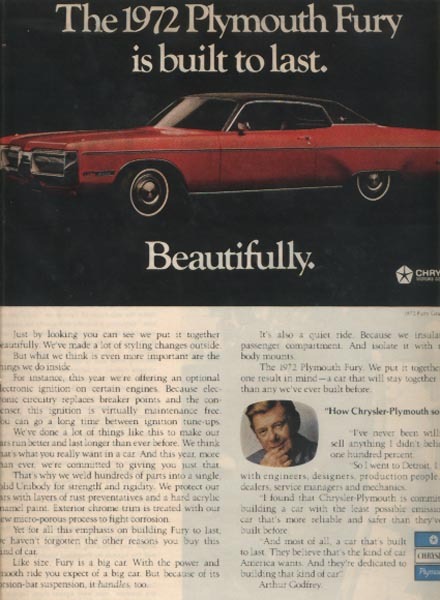 The ad describes the fact that this car has "Lasting beauty" which means that "Our 5-year/50,000-mile engine and drive train warranty gives the '66 Plymouth Fury a new kind of beauty". The text discusses what parts were covered under this warranty and what maintenance was requored by the owner to keep the warranty in effect. Plymouth Fury - Full color 9 1/2" x 12 1/2" ad has a picture of a Red Two-Door with a black top being admired by an enthusiastic couple who are leaning on the passenger side front fender. The ad headline explains that "We're showing you the front of this '66 Plymouth Fury in case you've only been seeing the rear. There's still the inside story." and the ad goes into detail about the options available. This ad is larger than my scanner bed so the outer edges of the ad will not be visible in the scanned view. Plymouth Satellite - Full color 9 1/2" x 13" ad has a photo of a Brown Two-Door against a white background. Below this photo is another photo of a couple standing back to back with their fingers up like guns preparing to duel. The ad headline explains that "Half the world wants a performance car, and the outher half wants a beautiful car. O.K., everybody." This ad is larger than my scanner bed so the outer edges of the ad will not be visible in the scanned view. Plymouth VIP - Full color 10" x 13" ad features a large drawing of a lady looking into this car and admiring the stylish interior. 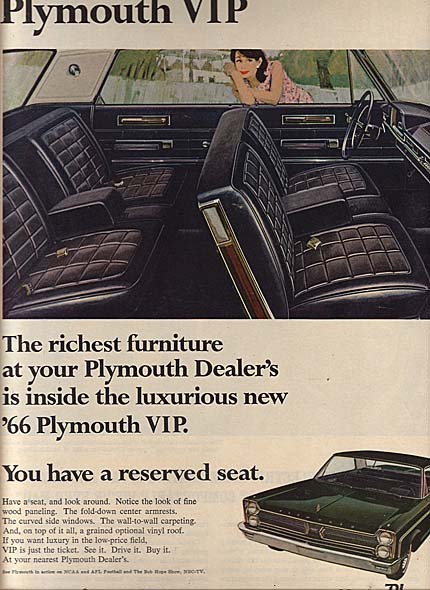 The ad headline claims that "The richest furniture at your Plymouth Dealer's is inside the luxurious new '66 Plymouth VIP". You have a reserved seat.. The ad features a photo of a Green 4-Door from the front discusses a few of the interior features of this car. This ad is larger than my scanner bed so the outer edges of the ad will not be visible in the scanned view. Plymouth Belevedere Satellite - Full color 10" x 13" ad shows a Blue Two-Door parked by a small lake where the couple that drove the car there seem to have sunk the small sailboat they were playing in. This is beneath three smaller pictures that show a lady sitting in the back seat and looking over into the front, the sail of the sailboat and a photo of the driver's side of the headlights. This is all under the headline that states that "Plymouth is out to win you over this year". The first line in the text says the "Belvedere Satellite. It's highly contagious. But very hard to catch". Belvedere GTX - Full color 7 3/4" x 10 3/4" ad for what THEY called their Supercar. There are four pictures of portions of this car, the big picture that shows a Red GTX from the driver's side of the front with a couple sitting chins-in-hand looking at it with love, a smaller picture that shows the console from the back seat, another picture of the right side of the back end of this car and the last picture shows a dark-haired lady wearing a red coat pondering a road map that seems to be placed on the hood of this car. The text mentions that the Belvedere GTX has the biggest GT engine in the world. Our Super Commando 440 V-8" with the Hemi being an option. It has you look the car over and, in case you miss anything, the text calls attention to everything they feel you should see. It talks about the Twin Hood Scoops, the Twin Chrome Exhaust Megaphones, the Special Suspension, the Pit-Stop Gas Filler, the Red Streak Tires, the Chrome Valve Covers and the Custom, No-Nonsense Grill. Plymouth Sport Fury - Full color 10" x 13" ad shows another way in which "Plymouth is out to win you over this year". Pictured are both a light green and a dark green two-door Sport Fury, each parked in a wooded setting and there are also two different pictures that show the interiors. The text tells us that Plymouth is going All Out this year, they said All Out and the rest of the text is spent mentioning their attempts to go "All Out". 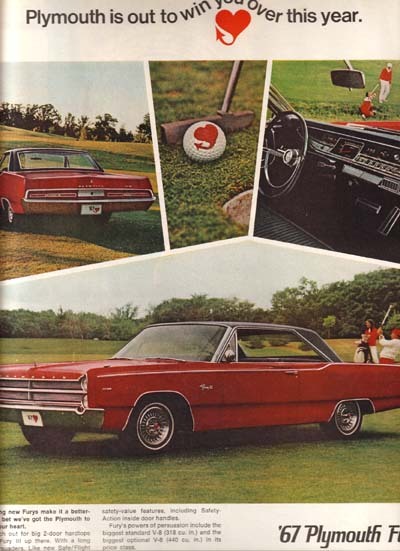 Plymouth Fury - Full color 10" x 13" ad showing three different views of a red two-door Fury III that seems to be functioning as a golf cart for a group of golfers. There is one exterior view of the car parked near the putting green, another view from the rear and a third from the inside looking over the black dashboard at the golfers outside. The ad claims that there are "25 tempting new Furys" being offered this year and the ad mentions some of their features. This ad is larger than my scanner bed so the outer edges of the ad will not be visible in the scanned view. Plymouth Fury - Full color 8" x 10 3/4" ad that says that "Plymouth is out to win you over this year." There are a series of four pictures, three across the top and the one lower one that runs across the page shows a Red Two-Door parked on a golfing course with people around it making shots. The three smaller pictures show the car from the rear, the dashboard and a golf ball sitting next to a putter. The ad text begins with "28 tempting new Furys make it a better-than-even bet Plymouth will capture your heart". The ad then goes on with their "long list of persuaders" and, after reading them all, comes back by saying "Then go drive a '67 Plymouth Fury. But, remember: we're going all out to win you over this year". Plymouth Fury - Full color 9 1/2" x 13" ad shows a green two-door and a yellow two-door parked in a wooded setting. The people in the ad are participating in a dog show and the ad headline claims that "Plymouth is out to win you over this year". There is a smaller photo that shows the dashboard of one of these cars and the text talks about the Lightning that this car will provide. The text then talks about the Interior first and then the exterior before getting to the engines. The text claims that the photos of these two Furys are rare because you seldom see them stopped. Plymouth Fury Wagons - Full color 10" x 13" ad has several photos of a Green Station Wagon parked on a river where several rowing crews are unloading their equipment and practicing their sport. 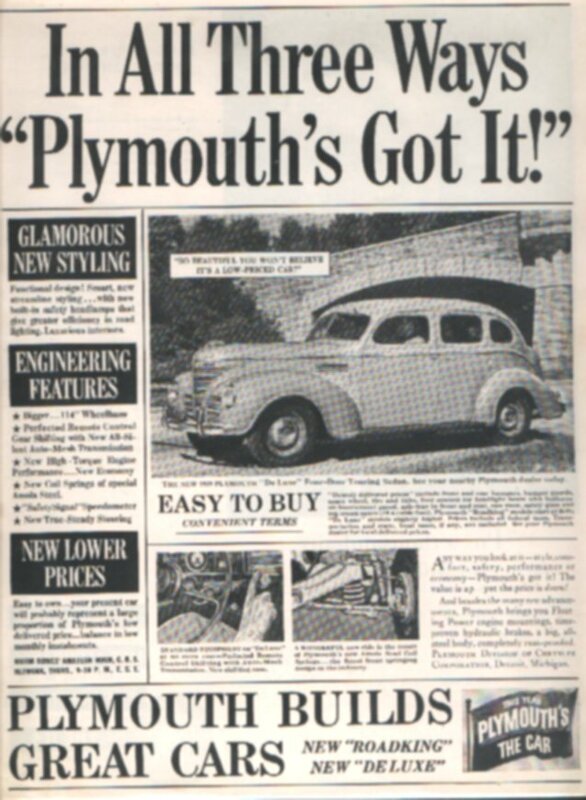 The ad headline claims that "Plymouth is out to win you over with the crew-size Fury wagons." The text talks about what a station wagon has to do and claims that "A Fury Wagon comes on like a family room on wheels". It also mentions all of the features that will allow you to feel this way and mentions some of the options too. Plymouth VIP - Full color 9 1/2" x 14" ad with several photos of a Light-Blue Two-Door. The ad has a exterior photo of this car parked at the curb with a well-dressed couple standing beside the car. There is also a shot of the interior and another of the car's front end. The ad headline warns that "Plymouth is out to win you over with the elegance of VIP". This ad is larger than my scanner bed so the outer edges of the ad will not be visible in the scanned view. Plymouth Fury - Full color 9 1/2" x 13" ad has a photo of a Red Four-Door parked on a brick surface. The ad headline claims "Last year, over a quarter million owners of other low-price cars were won over to Plymouth. It started a movement, a momentum, a beat." This ad is larger than my scanner bed so the outer edges of the ad will not be visible in the scanned view. Plymouth Fury - Full color 9 3/4" x 14" ad with a photo of a White Two-Door with a Black top taken from behind. 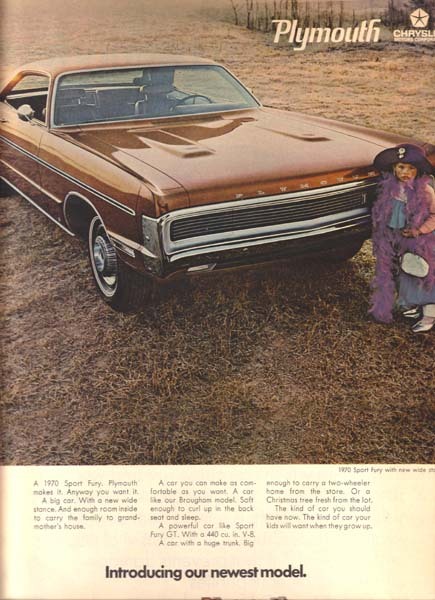 The ad headline introduces "The 1968 Plymouth Fury. Not so long ago, you couldn't get this much luxury, even in a luxury car" and then at the end of the ad it says that "the Plymouth win-you-over beat goes on". It goes into detail about the instrument panel, options inside the car, the Sport Fury's grille, carpeting, body, frame, roof and floor. 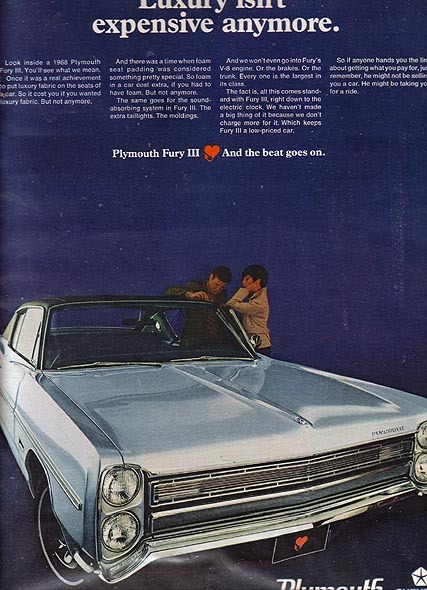 It ends by saying that "Last year, over a quarter million owners of other low-priced cars were won over to Plymouth"
Plymouth Fury III - Full color 9 1/2" x 13" ad that shows a couple admiring a parked light-blue two-door Fury III. The ad headline claims that "Luxury isn't expensive anymore" and the ad contains information about features about this car. This ad is larger than my scanner bed so the outer edges of the ad will not be visible in the scanned view. Plymouth Road Runner - Full color 7 3/4" x 10 3/4" ad for this popular performance car. At the top of the page is the cartoon character of the Road Runner going full speed with the ever-present "Beep-Beep" and under this is a picture of a Red 1968 Road Runner with a black hood scoop. The text talks first about the horn in this car going Beep-Beep then gets into the details about why it can proudly make this sound. It talks about the standard engine being a 383 cu. in. with hi-performance parts, a 426 Hemi was also available, then goes on to the suspension and brakes before ending up with the special body and markings. Plymouth Road Runner - Full color 16" x 10 1/2" Two-Page ad for this High-Performance Classic of the '60s. The ad has a drawing of a Blue Road Runner on the Bonneville Salt Flats with smoke pouring out from under all four tires. Standing next to this car is the cartoon Road Runner, courtesy of Warner Bros., holding a helmet in his hand. The ad gives a good list of special features and technical specifications for this car including the last in the list which is "A total lack of unnecessary doodads, gegaws and falderal." Road Runner Hardtop - Full color 7 1/4" x 10 1/2" ad for their New Improved Beep-Beep. The Road Runner flying past the flattened coyote is drawn at the top of the page and a picture of a Yellow Road Runner, at rest, is shown at the bottom. The text talks about the overwhelming success the Road Runner has been so they have made an improvement, they have added a Hardtop model. This car has the same features that has made the other a success but this one has premium vinyl too, without making the price unwieldable. Plymouth Satellite - Full color 9 1/2" x 12" ad has a photo of a White Two-Door parked in a field by a hot air balloon that is being held to the ground by a single man. Next to the car stands a man in a helmet and three attractive women who seem to be keeping him from taking off. 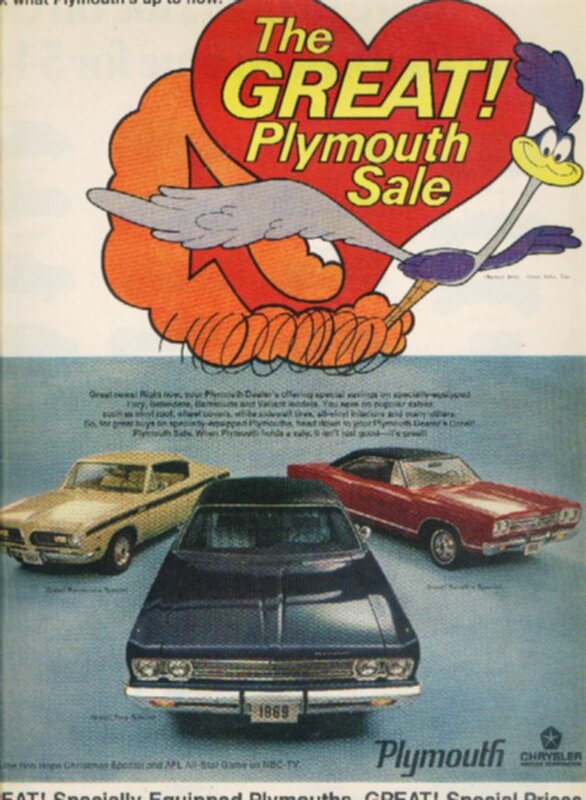 The ad headline informs us that "Plymouth Satellite is having it's hottest year in history. And the beat goes on." This ad is larger than my scanner bed so the outer edges of the ad will not be visible in the scanned view. Plymouth VIP - Full color 10" x 13" ad has a Green two-door sitting against a dark background with a well-dressed couple standing beside it. Both the couple and the car seem to be "set-up" and stylish as they regal themselves with pomp. The ad headline claims that "There's a little bit of VIP in all of us." and the text mentions, slyly, some of the amazing things this car will supply you with. Plymouth Satellite Sport Wagon - Full color 10" x 14" ad with the beginning of it saying "1968 Plymouth Satellite Sport Wagon. Its tail gate opens up and down, side to side, and washes its own rear window. How about that, wagon fans?". 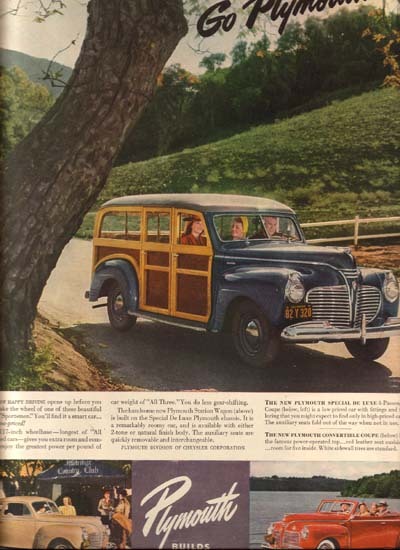 Pictured in the ad is a wagon parked with its front end at the front and the rear facing toward us. The tail gate is open, side to side, and there are four different "hearts" by the back end with information in each. The first one talks about the Tail Gate opening side to side or up and down. The second one talks about the two buttons associated with the back window. The first raises the window up or down and the second washes it, clean and dry. The third talks about the cargo area beneath the seats and mentions how durable it is. The fourth talks about last year over a quarter million owners of other low-cost cars were won over to Plymouth. I wonder how many of them were buying something else instead of a Plymouth. Plymouth Sport Fury 2-Door Hardtop - Full color 9 1/2" x 13" ad has a photo of a Bronze colored two-door parked on a light colored background. 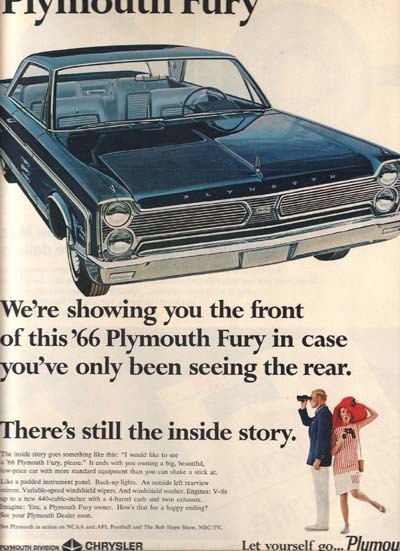 The ad headline says "Look what Plymouth's up to now: A completely new Fury for 1969." There is a drawing that thows that this has "3" more room" and a drawing of the dashboard where the Miniaturized Floodlights are shown. They claim that this car will beat the one that "last year broke all of our old sales records". Plymouths - Full color 10" x 13" ad for "The Great Plymouth Sale". Pictured in the ad are Barracuda Special, Satellite Special and Fury Special. This ad is larger than my scanner bed so the outer edges of the ad will not be visible in the scanned view. Plymouth Sport Suburban Wagon - Full color 9 3/4" x 13" ad with a picture of a White with wood-panel Plymouth Station Wagon in an ad that says that, "If the looks don't get you, the engineering will". The drawings in the ad indicate that this has a rear-tailgate that opens like a door and that the airflow will slide under the Air Vane on the rear roof. The text claims that "It'll take you about 28 steps to walk completely around our new Sport Suburban Wagon. 28 steps of rounded side contours, curved glass and sloping rear lines. In another minute you can get the feel of the driver's cockpit, check out the Safe/Flight instrumentation and give the interior a once-over. About one minute and 28 steps after you first see the '69 Sport Suburban, we think its looks will get you". Plymouth Sport Fury - Full color 10" x 13" ad shows a copper colored two door parked in a yard as a little girl dressed for Halloween stands in front of it, waiting for night to fall so she can begin trick or treating. The ad headline says Plymouth is "Introducing our newest model". This ad is larger than my scanner bed so the outer edges of the ad will not be visible in the scanned view. Plymouth Sebring - Full color 10" x 13" ad for their Personal two-door car. At the top of the ad is a picture of a Brown 1971 Plymouth Sebring with everything surrounding it a blur of motion. The ad headline brags "The 1971 Plymouth Sebring. There's not another car like it. Not even our four-door". The text talks about what their thought-process was when designing this car then mentions and describes the other cars they were offering this year. This ad is larger than my scanner bed so the outer edges of the ad will not be visible in the scanned view. Plymouth Sebring - This is a slightly smaller version of the previous ad. They show a Brown Plymouth Sebring and they say that "There's not another car like it. Not even our four-door". The first section of the ad says "Here's how we're different" and explains that their idea was to design, engineer and build a personal two-door car. They claim that "We didn't compromise" and claim that every inch of the Satellite Sebring was designed to be a personal two-door car. They show how the Sebring was built for two-door people and the Brougham was built for four-door people. They state in the ad that they have built some cars, Sebring, with the intention of being two-doors and others, Satellite, Satellite Custom and the Brougham, with the intention of being four-doors. Plymouth Fury - Full color 10" x 13" ad shows a red two-door Fury and claims that it "is built to last". This ad is larger than my scanner bed so the outer edges of the ad will not be visible in the scanned view. Plymouth Sebring - Full color 9 1/2" x 12 1/2" ad has a photo of a Red Two-Door parked in front of an open garage door, next to a bicycle and under the basketball hoop. The ad headline introduces the "Mid-size Plymouth Satellite. The family car that doesn't look like one." This ad is larger than my scanner bed so the outer edges of the ad will not be visible in the scanned view. Chrysler-Plymouth - Full color 28-page Dealer Brochure for the models available from both these brands. 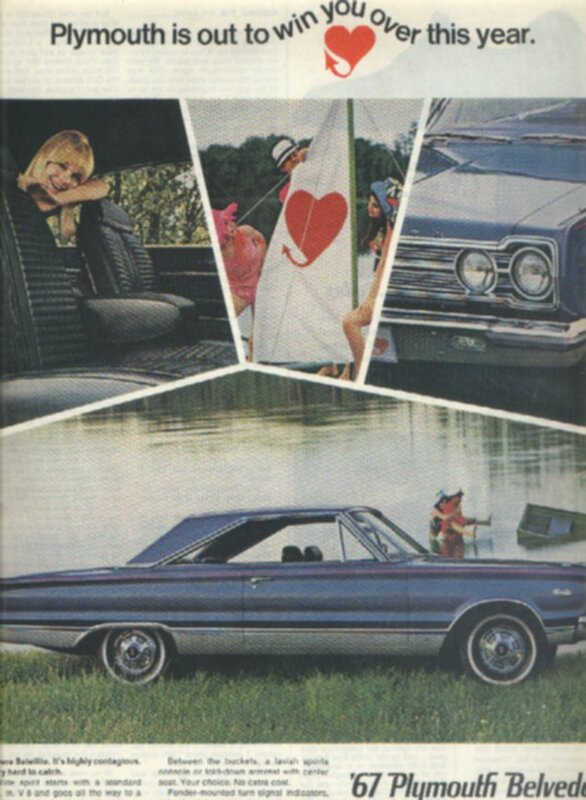 The first twenty pages are devoted to the models from Plymouth and pages 21 - 27 are filled with the several models that Chrysler was offering. There is a page for each the options for Plymouth and and the last page has information that there were 58 different models to choose from. There are grease smudges and stains on this item. Plymouth Fury - Full color 9 3/4" x 13" ad has a photo of a Red Two-Door parked on a stormy beach where waves are breaking in the background. 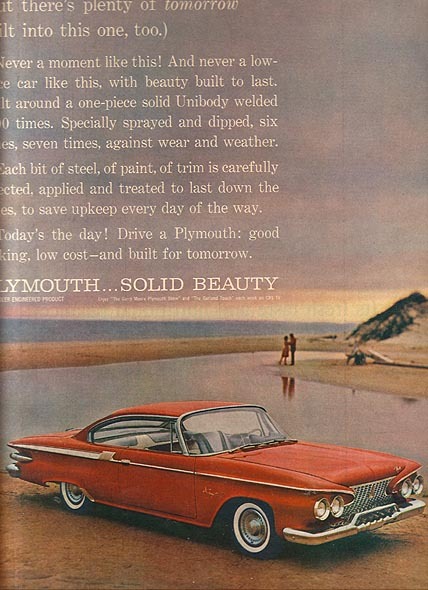 The ad headline assures us that "Part of the beauty of the new Plymouth Fury is the way it fights rust and corrosion." The text talks about the fact that "Every new Plymouth Fury, for example, is treated with layer upon layer of rust preventatives" and they mention that the material used was designed to deaden sound too. The ad mentions other features too including the Electronic Ignition System that is now standard equipment. Plymouth Voyager - Full color 11" x 10" 23-page Dealer Brochure for their Family Vans. The brochure contains color pictures and descriptions of the Plymouth Voyager LE, the Plymouth Voyager SE and the Plymouth Grand Voyagers. There are pages devoted to Features, to Options and to the Seating. The Engineering of this vehicle is discussed plus five pages of Tedhnical information before getting to the page with the colors available.